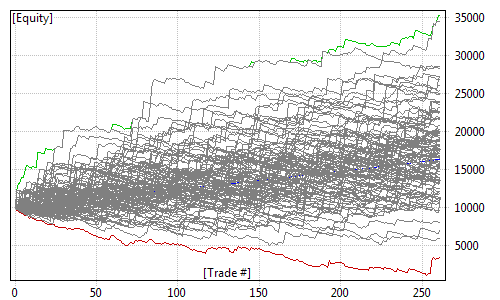 Trade visually from Charts, or use Analysis tool to generate order list, or place orders directly from your code using Auto-trading interface. Whatever your style is. The choice is yours. In this example it shows cross-correlation between symbols from user-defined list. This is just one of many things that you can do using Exploration. Flexible user interface can be arranged and customized in any way you like. Multiple monitor setups are fully supported. Windows can be docked or floated. Don't fall into over-fitting trap. 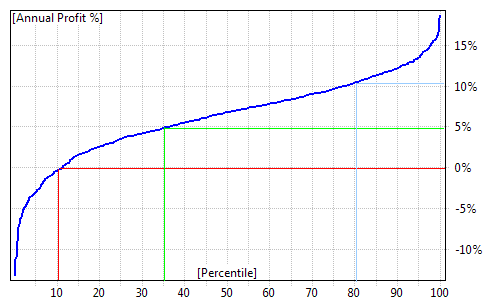 Validate robustness of your system by checking its Out-of-Sample performance after In-Sample optimization process. Entry-level version for End-of-day and swing traders. End-of-day and Real time. Intraday starting from 1-minute interval. 10 symbols limit in Real time Quote window. 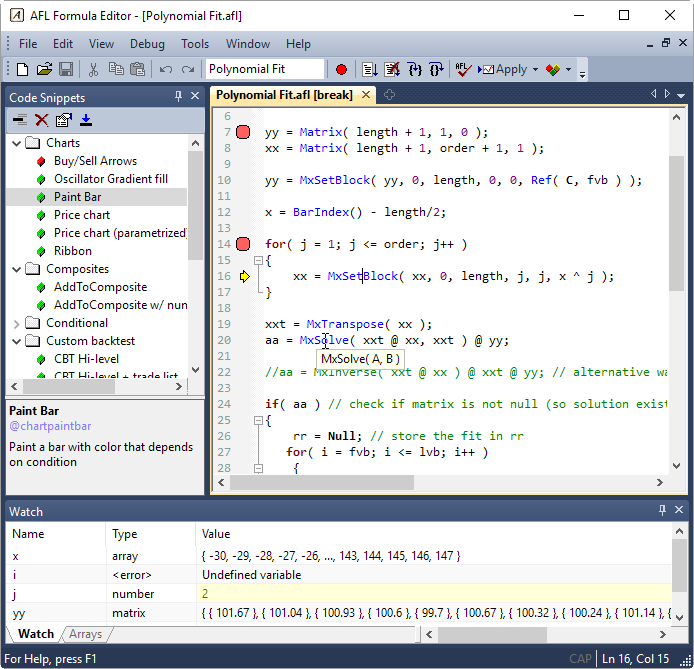 2 simultaneous threads per Analysis window. 32-bit only. 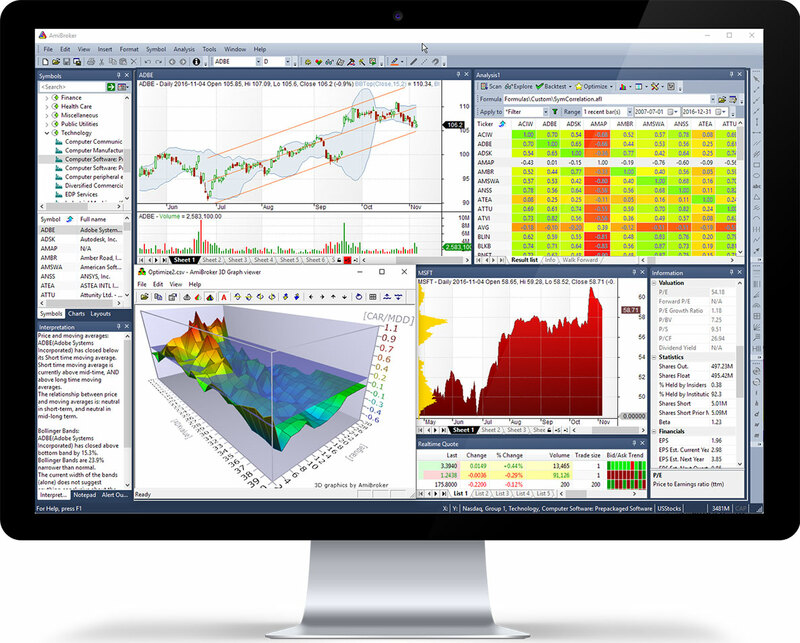 Professional Real-Time and Analytical platform with advanced backtesting and optimization. End-of-day and Real time. All Intraday Tick/Second/Minute intervals, Unlimited symbols in Real time Quote window. Unlimited symbols in Time&Sales. MAE/MFE stats included. Up to 32 simultaneous threads per Analysis window. Includes both 64-bit and 32-bit versions. AmiQuote - quote downloader from multiple on-lines sources featuring free EOD and intraday data and free fundamental data. All our licenses are perpetual which means you can buy once and use the version that you purchased forever. They also come with 24-month free upgrades, support and maintenance which means that you will be able to upgrade to the newest version during that period at no cost. All licensed users are also entitled to receive 50% discount on upgrade purchases past free upgrade period. System requirements: Microsoft Windows 10, 8.1, 7, Vista, XP, 2000, at least 512MB RAM. Apple Mac users can use Bootcamp / Parallels / VMWare to run AmiBroker. Copyright ©1995-2019 AmiBroker.com. All rights reserved.